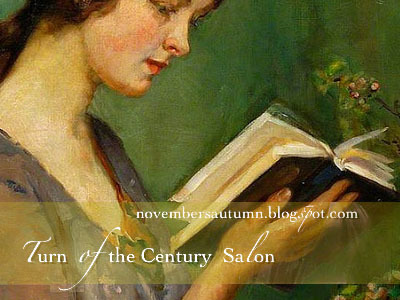 The Turn of the Century Salon, hosted by Katherine @ November's Autumn, is a monthly event where you can share posts relating to literature and/or authors from the 1880's - 1930's. I was at The Book Depository ordering Parade's End and on a whim decided to add The Good Soldier and what a good decision that turned out to be. The very definite opening line " This is the saddest story I have ever heard" immediately captured my attention and the discovery a few lines later that the narrator was, in fact, a part of that story made it even more intriguing. The Good Soldier is about two married couples; Americans John and Florence Dowell and Edward and Leonora Ashburnham who are English. 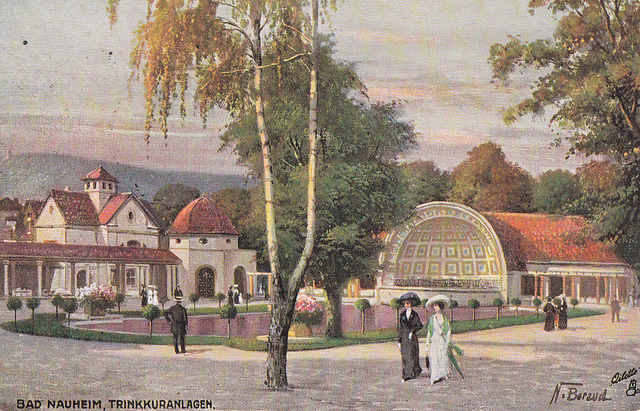 For nine years of the first decade of the twentieth century they travel, socialise, and take the waters at the German spa Bad Nauheim - a friendship of ' extreme intimacy' the narrator assures us although soon after he admits that no one knew anyone else very well at all.
" But the feeling that I had when, whilst poor Florence was taking her morning bath, I stood upon the carefully swept steps of the Englischer Hof, looking at the carefully arranged trees in tubs upon the carefully arranged gravel whilst carefully arranged people walked past in carefully arranged gaiety, at the carefully calculated hour, the tall trees of the public gardens, going up to the right; the reddish stones of the baths - or were they white half-timber chalets? Upon my word I have forgotten, I who was there so much." It was enough that they were 'good people', a term which has nothing to do with being good but refers to social class. Wealthy, idle people who were outwardly the perfect examples of well-bred Edwardian respectability. The reality of what lies beneath that genteel facade slowly emerges during the course of the story and it is not pleasant!
" I have, I am aware told this story in a very rambling way so that it may be difficult for anyone to find their path through what may be a sort of maze." ......and one attempts to keep up and put the pieces together it is hard to remember Dowell is not a reliable narrator. I thought it was brilliant! Sure to be one of the best novels I read this year. A friend of mine is read this novel for her adultery in literature course and I have been thinking I should reread it. Your review may dip the scales. I can't wait to reread it. Hope you will enjoy the second time round. I've seen several reviews of Ford's novels lately - though more of Parade's End. I do want to try his books. I love unrealiable narrators! The BBC production of Parade's End has really brought FMF back into the spotlight. The Good Soldier was published first and it is only 150p which is why I decided to read that first. Do try it! Wonderful! I read this as an undergrad and loved it! Actually, I loathed it until one line towards the end of the novel suddenly made a lightbulb go off in my head and suddenly I saw everything I had just read from a completely different perspective. I loved how Ford did that. I don't think I would have loved it so much if I'd read it when I was young as I wouldn't have appreciated the brilliance of the way it's constructed. Superb reading! I adored this book. I don't think I liked any of the characters but the writing is just wonderful. I'm probably about a quarter of the way through Parade's End and I'm loving that too though I think it might take me a while to finish. I really enjoy Ford's impressionistic style of writing. Plus the BBC adaptation was brill! So did I! I can't wait to read Parade's End but at the same time I want to wait a while - I don't know how long I'll be able to hold out. The BBC programme hasn't been shown here yet so something else to look forward to. This was one of my classics challenge reads last year. A great book! Glad to hear praise without reservation for this, one of the best twentieth century novels I've read, I think. I am certainly with above commenters who are all for a re-read - it is definitely one of those books that warrants one.